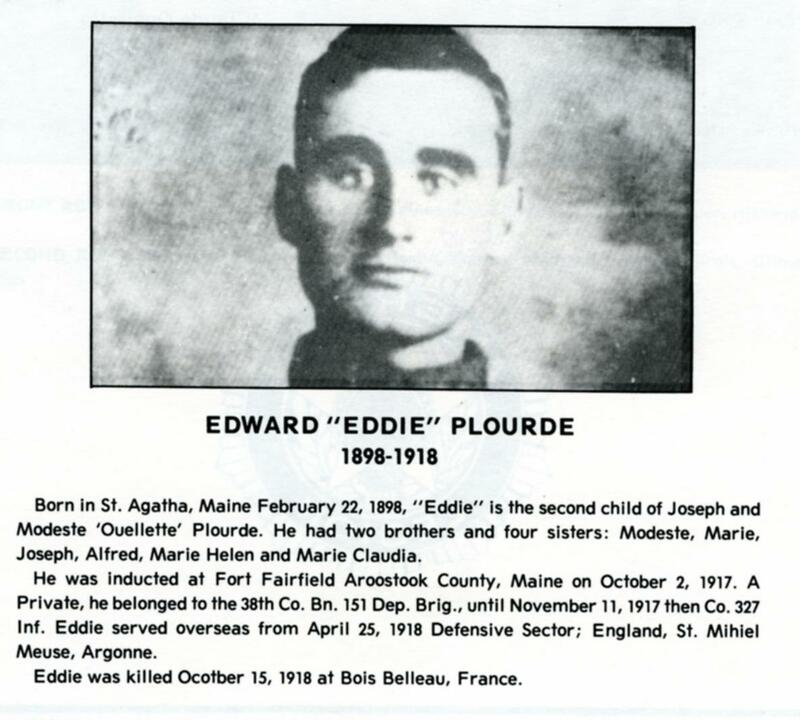 The World War I Veterans database was extracted from multiple information sources, including the Maine Military Men, 1917-1918 which was published as the Roster of Maine in the Military Service of the U.S. and Allies in World War 1917-1919. Vol. I-II. Augusta, ME, USA: n.p., 1929. 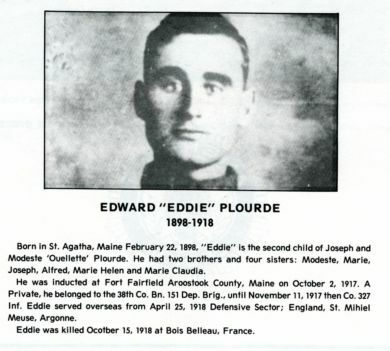 Some of the information was supplemented by the World War I Draft Cards available at the National Archives and on Ancestry.com where you can search however to view the record, you must have a paid subscription. The database was updated on 11 November 2017 and now includes World War I Veterans from multiple towns in the St John River Valley. See the tribute to the Veterans of Frenchville, St Agatha, and Sinclair, Maine that was added to YouTube for Veterans Day 2017. See my recommended readings and maps on World War I. See also the writeup and picture of the USS Madawaska which was a World War I troop transport. Did some of these veterans go to or come back from Europe on this ship? 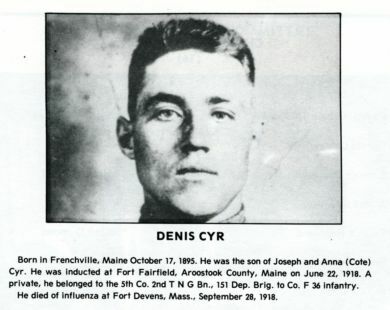 Two young men born in Frenchville died in the service of their coutry in World War I -- Denis Cyr and Eddy Plourd, for whom the American Legion Post 145 in Frenchville is named, the Cyr Plourde Post. The above photos were scanned from the 50th Anniversary 1935-1985 souvenir book of the American Legion Cyr Plourde Post 145, Frenchville, Maine. 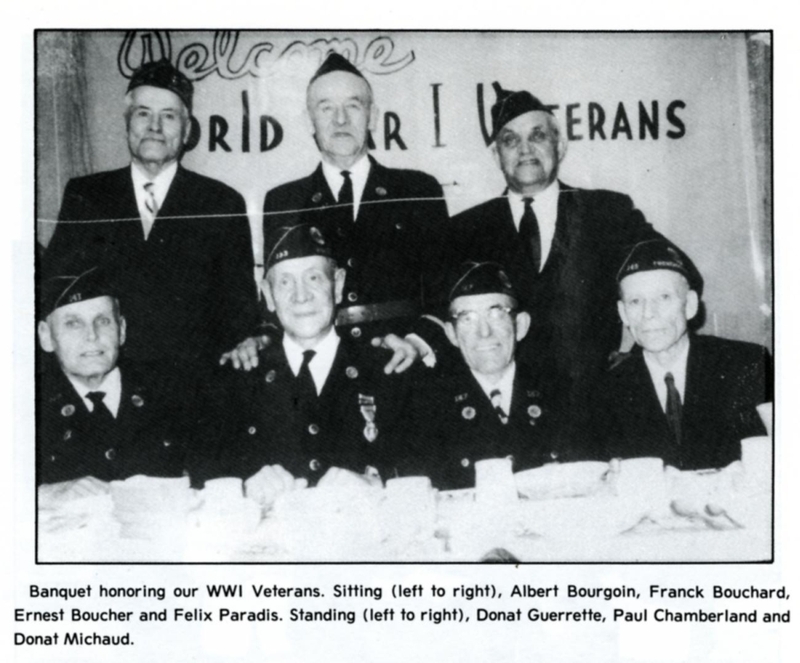 Additional photo from souvenir book shows the American Legion Cyr Plourde Post World War I veterans. You can search the Frenchville World War I veterans database using any of the form fields below, either as single fields or in combination with other fields. In order to use this form most effectively, please be sure to read the introduction to the database search. Note that because a separate browser is launched for the search results, you may need to allow Popups for this site, before you click the Search button.